Not only was it a heavily serialized show, it was created and produced by Shawn Ryan, who created one of my favorite TV shows of all-time, "The Shield." Yet, for some reason, I missed this show when it first aired. Apparently I was not alone, because the ratings dropped like a stone, and ABC didn't even bother ordering the back nine episodes. Anyway, I happened to have some digital credit with Amazon and went shopping a while ago, when I noticed that "Last Resort" was available for a reasonable price. I used my credit and promptly forgot about the show. I'd been binging on old seasons of "Survivor" (available via Amazon Prime) while running on the treadmill, but after the lameness of the "Redemption Island" season, I needed a break for Jeff Probst and company. "Last Resort" has one of the best pilot episodes I've ever seen! * Andre Braugher exudes gravitas as Captain Chaplin, and Scott Speedman (who I've only seen in the "Underworld" movies) is very good as the executive officer. Add to that Robert Patrick as the crusty chief of the boat, and you've got a strong core cast. I'm about halfway through the series right now, and while there's been a couple of weaker episodes, none has been a clunker. It's a shame this show didn't get more traction when it aired, but then again, maybe it's a good thing that there's a (relatively) tight 13 episodes - like a good mini-series. * Of course, "Flashforward" was also one of the best pilots I've ever seen, and that show devolved into a mess by the end, so a strong start certainly doesn't guarantee a strong series. Fall is my favorite season. It has the best holiday (Thanksgiving), it's the best season for running road races, and of course, it's when new TV shows debut, as well as when established ones return. I sit down over the summer and plot out what shows I can manage to record on my dual-tuner TiVo, noting conflicts so as to prioritize. (Yes, I know I should just go get a new TiVo Roamio, which can record up to six shows at the same time.) Inevitably, I plan to watch way too many shows than I have time for, but as it turns out, more than half of the new shows that I tab end up either getting canceled quickly or dropping off my radar (or both). As much fun as it would be to have Jack Bauer be the President, that's not what this show is. If anything, star Kiefer Sutherland is trying very hard not to remind us of Bauer, from the nerdy academic glasses to the mild manner. 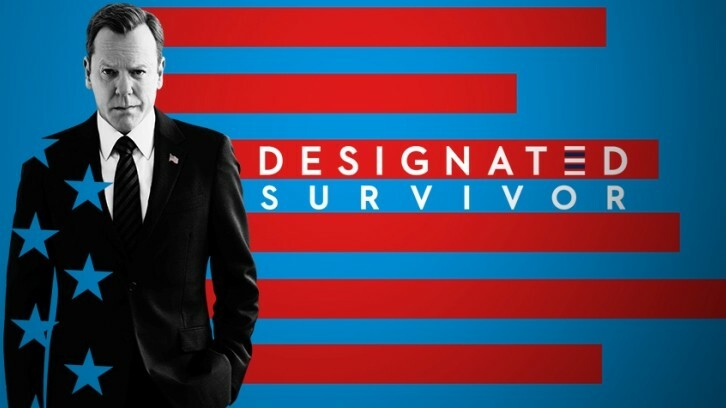 The basic conceit is that Sutherland's character Tom Kirkland is the "designated survivor" - the Cabinet official who is kept away from the State of the Union speech in case there is a decapitating strike, so that there will be continuity in government. Of course, Kirkland was asked to resign his position earlier that morning but hadn't done so yet, which has already given rise to questions about whether he should remain President. The show does have a lot in common with "24" - a terror plot, government machinations, disloyal government officials, and family soap opera elements. It looks like the pattern so far is one episode = 1 day, though I imagine it will start to space things out a bit. I've liked it, but I wish they had cast a different actress instead of Maggie Q, who just seems to stand around and stare at things, and who I find to be just as wooden here as she was in "Nikita." There are few new ideas in Hollywood. Rebooting a nearly 30 year old movie certainly doesn't seem very imaginative, so I was somewhat skeptical of this show. Plus, Mel Gibson has descended into such awful depths in real life that it's hard to disassociate his roles from him. However, my wife wanted to give this a try, and since this airs at the same time as "Survivor" (one of my top returning favorites) and "Blindspot," something had to give way. "Blindspot" is okay, but strangely less compelling than it should be, possibly due to the complete lack of chemistry between the lead actors (Jaimie Alexander and Sullivan Stapleton). My wife has already given up on it, so I figured I could catch up on the NBC website. Anyway, I did not have high expectations for "Lethal Weapon." It easily surpassed those low expectations. There's something to be said for a TV show that knows what it wants to be and executes successfully. Thus far, there's no long backstory, no secret conspiracy responsible for Martin Riggs' wife's death in a car accident - it's just a competent mix of mismatched buddy comedy and action. This was bad. I had low expectations based on the bad reviews it had been getting, but it was even worse than I had feared. Dull lead actor. Stupid words on the screen telling us that we're looking at "power" or "aluminum foil" ... as if we're too dumb to figure that out. I mean, if you're going to put words on the screen to help viewers out, why not Al-Al2O3 to teach them some chemistry? Watching the pilot episode was one too many. Fortunately I have the original series on DVD. Maybe watching some episodes will restore the brain cells killed by watching this reboot. Sitcoms aren't my cup of tea, and haven't been since "Married with Children" ended a long time ago. (Or maybe "Malcolm in the Middle.") My preferred style of storytelling is serialized conspiracy; sitcoms are about as far away as you can get from that. However, Kristen Bell earned some benefit of the doubt from her "Veronica Mars" days, so I decided to give this a try. The set up is that her character, a self-centered, narcissist has died and ended up by mistake in "the good place" (not exactly the Christian Heaven, but something kind of like it). It's awesome for her, but her being there is causing breakdowns due to the misfit. The show appears to be about her efforts to change her character for the better. It was okay, and Bell did a good job of making an unlikeable person somewhat likeable, but there wasn't anything there that grabbed me and demanded that I continue watching. Time travel shows are all of a sudden a hot item on TV. There's CW's "Frequency" and "D.C. Legends of Tomorrow," not to mention the time traveling abilities of the Flash, which are currently driving the storyline on "The Flash"; ABC's upcoming "Time After Time"; and this show. Much like "Legends of Tomorrow," this is about a bad guy who gets access to a time machine, which he uses to try to change history so that the present is more to his liking; and the team of good guys sent to restore the timeline. The team has a historian who happens to know every trivial little detail about the Hindenburg disaster, which is quite fortunate, since the first mission is to fix what the bad guy did then. One of the tropes of time travel stories is the idea that you can't really alter the past; if you save someone from dying the way they did in "history," then the flow of time will find some other way to kill that person. Another trope is that tiny deviations in the past will somehow cause significant changes in the present when the time traveler returns. These tropes are in tension with each other (though not totally inconsistent), but this show uses both. The second trope has always bothered me in that there's rarely a satisfactory explanation for how the time traveler can integrate into the changed universe effectively. Take the movie "Timecop" with Jean-Claude van Damme. At the end of it [SPOILER], he has changed history by saving his wife from dying 10 years earlier, and when he returns to the present, he's still married to her, and they have a little child. How can he remember what's happened in the last 10 years in this timeline? And if he has those memories, how about his original memories? How does he know which are real? There was an "Outer Limits" episode called "A Stitch in Time" that did confront this issue, with the twist being that the time traveler remembered both universes, but suffered headaches and other problems as a result; and as she engaged in more and more time travel, her health problems worsened. The best time travel story I've come across in terms of having a mechanic that seemed internally consistent is Dean Koontz's novel Lightning.